Revenue sharing is one of the strategies that Uganda Wildlife Authority and Uganda tourism sector improvised to compensate local people adjust to wildlife national parks for their loss of access and ownership of national parks land. The government scraps 20% of the total money collected from tourism and divert it to local communities to improve the standards of living for the local people. This year, Bwindi local communities are to receive shs4b as a 20% share from the sale of gorilla permits in Bwindi impenetrable forest national park. The money will be used to finance the implementation of conservation projects identified in the four districts surrounding Bwindi forest national park. After a certain period of time, Uganda Wildlife Authority sends money (local community share) to the respective districts. The districts use 5% of the 20% to cover administration costs passing over the 95% to different communities to fund local projects set up by local people. The revenue sharing program was initiated in the Uganda wildlife Act Cap 200 of 2000 where communities adjust to gorilla and other wildlife parks are given 20% of the total money collected from the sale of gorilla permits, park fees and other wildlife activities within these parks. Bakiga community project a charity organization registered in the United Kingdom. All the funding that comes to Bakiga community project is used to construct water tanks, the project patterns with Bakiga lodge which also help t create employment for locals working as waiters, waitresses and cleaners at the lodge. He project is based in Nkuringo sector south of Bwindi impenetrable forest national park. Here local people are funded by forest policy and institutional ranches of food and agriculture to grow tea plantations which separate the park and local gardens, this was one strategy of avoiding human wildlife conflicts in Bwindi . Established in 1995, the Mgahinga Bwindi impenetrable forest trust is a non-governmental organization, which aim at improving the lives of local people adjacent to the park. The project gets funding from other non-governmental international organizations which money is used to improve the standards of living for local people. Located in southwestern Uganda, Bwindi is impenetrable forest national park is a first stop Centre for most Uganda safaris bordered by the Democratic Republic of Congo (DRC) and the Virunga national park. The impenetrable forest is home to half of the world’s mountain gorillas with 17 mountain gorilla families available for trekking. Gorilla tour is the major activity in Uganda, which attract the highest number of tourist’s rom all over the world. Gorilla tourism in Bwindi was started in 1993 and gorilla numbers have increased over time, which is a great achievement. Gorilla families in Bwindi are split in four sectors, which are Buhoma in the north, Ruhija in the east, Nkuringo and Rushaga in the southern part of the national park. A traveler can choose which sector to visit for gorillas. Each gorilla family has a different number of mountain gorillas whose behaviors also vary. Mubare family, Habinyanjyja, Rushegura, katwe family, Christmas group, Oruzogo family, Bitukura family, Kyaguliro family, Nshongi family, Mishaya family, Kahungye family, Busingye gorilla group, and Bweza family. Each gorilla family is visited by a group of eight people everyday hence eight gorilla permits available everyday for every group. Also, two gorilla families of Bushaho and Bikyingi are still undergoing habituation process in Rushaga sector and will be opened for tourism soon. Interestingly, Bwindi gorilla tours are relatively cheap and affordable costing $600 for foreign non-residents, $500 for east African residents and 250,000 forest African residents compared to $1500 in the neighboring Rwanda. In general, the sharing of gorilla tourism revenue creates good relations between the government, park management and local people. 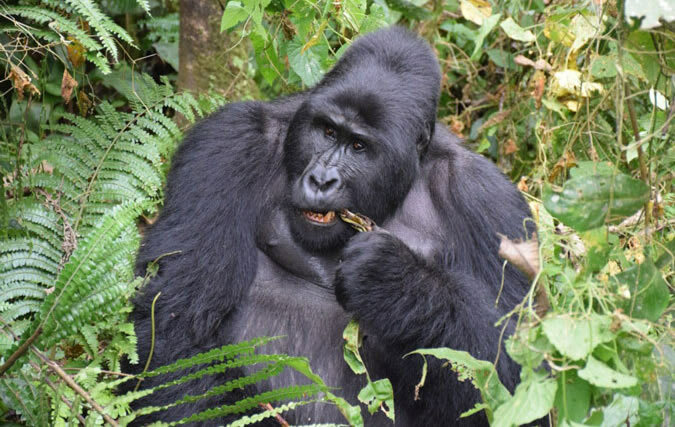 Book a Uganda gorilla tour to Bwindi, meet face to face with mountain gorillas; in the jungle ands spend quality time with the local people of southwestern Uganda.